Blessings. | love lives on. I woke up in the middle of the night and could have sworn I saw Jake out of his condo. In fact I said out loud “Jake, how did you get out of your condo”. He was asleep, in the condo. Oh, darkness, you got me. Anyway, it got me thinking how when Max died everyone told me that I’d see him (or his shadow) from time to time (to not think I was crazy) and that I’d dream about him. It’s been five years and neither of those things ever happened. Not ever, not once. (Unless he was wearing the cloak of invisibility in my dreams, which is entirely possible). I’m not upset about this. I mean if it happens, great, and if it doesn’t, well there is nothing I can do about that. Max, was easy-going. He liked everyone he met. Everyone liked him back. During his senior years, when we would go on walks, squirrels were not threatened by him, birds did not fly off. Towards the end, walking him was a lesson in peace. We didn’t get very far and it was slow going, but to watch him sniff and take it all in… just existing was joy to him. When Max died, I honestly thought I would grieve forever. As we all know, eventually, you move through the sadness. I think of him often, a little more during the holidays since his face adorns many ornaments (and I’m reminded of how much I tortured him to get a Christmas card photo). Max taught me to be kinder, to be gentler, to give life time. I carry him as a part of me and I see moments with Melvin that take me to Max. I may never dream of him, or see his shadow but that’s OK, because I’m pretty sure he never really left me. He imprinted on my world, his sparkle is sprinkled all around. Max will always be one of the greatest gifts ever given to me. During the holidays, memories warm my heart, and I feel very blessed. What a touching post and one that really hits home with me. I lost my love of my life (my cat) last year just before Christmas and this year has been tough. The same as you…his ornaments adorn our Christmas tree as a constant reminder. I was also told that I would dream about him or think I seen him around the house….it has not happened for me either! It makes me a little less sad to know I’m not the only one! I’m sorry you lost your love. While the first Christmas can be difficult, the ones that follow get softer. 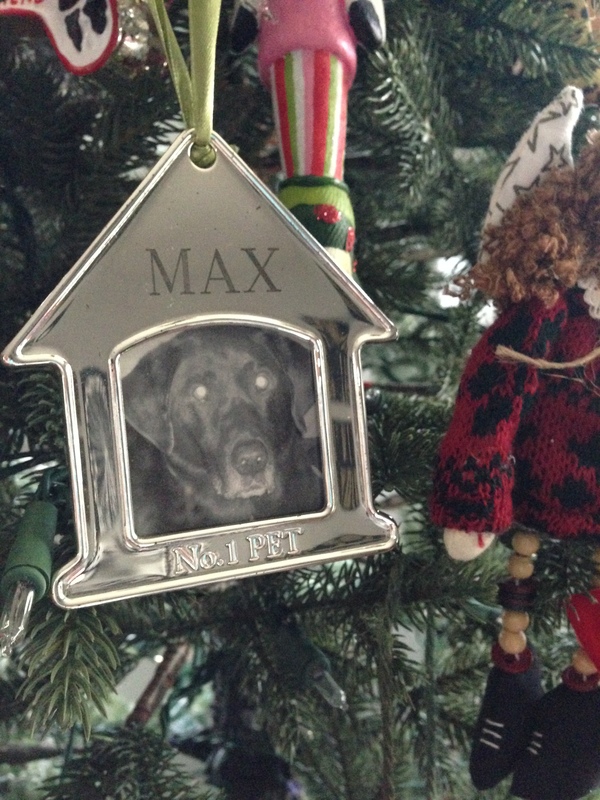 Those ornaments of Max make me smile, yours will too one day. Why o why did I have to read this at work, i’m barely keeping it together. To answer my own question I read it because I LOVE this blog SO much that I can’t wait to get home to read about your boys. You just made my whole week with this comment! You are too kind, even after we made you tear up! I have the pawprint of my childhood dog. I keep meaning to make an ornament out of it but don’t have the heart yet. Ohhhhh, the paw print. That is tougher. The photos I find to be easier but there is a box of Max’s things downstairs and while having the box makes me happy, opening the box is not something that I do. This post is so moving and poignant. The holidays are such a happy time and yet they can be so melancholy as well. We were recently at a party and the hostess had what looked like three dozen stockings displayed about. A closer look revealed lots of pet’s names and that just seemed sweet. A long winded way of saying I love that ornament of Max and I’m sure his spirit lingers with you, whether you sense it, see it or just know it. Yes, like others, I’m already crying. For Max and for all my furry friends, past & present. Just looking at the ornament did it for me. Helps me to remember on days like today, where Jake is totally freaked out by the wind and yes, I get frustrated at letting him in & out a 100 times & his hiding under the grill so no one can get to him. I need to remember all the times that he has snuggled with me and given me kisses just when I knew I needed them. Thanks for sharing your guys with us! I love this post! Sweet words describing what sounds like a very sweet pup!